10 Signs that She Loves You - 80% Guys Don't Know This! Many of you guys fall for women, but fail to realize the signs that she loves you. Love is a lovely emotion. All of us feel it at some point in our lives. Yet for everybody, the same emotion comes with varied and different experiences. For some, it is the best thing to have ever happened to them. While for others, it has been one of their worst nightmares. Love is beauty, every mind, heart, and eye perceive it differently. Yet, everybody wants to experience love at some point in their lives. There comes this someone special in your life with whom you’d want to stay and spend good time. You would want to make memories with this person and never want this person to go away. Men drop clear hints for the women they like. But women, on the other hand, can be comparatively shy or reserved to do so. However, she’d still drop subtle hints only if you could figure out those hints and take the call to take things to new heights. 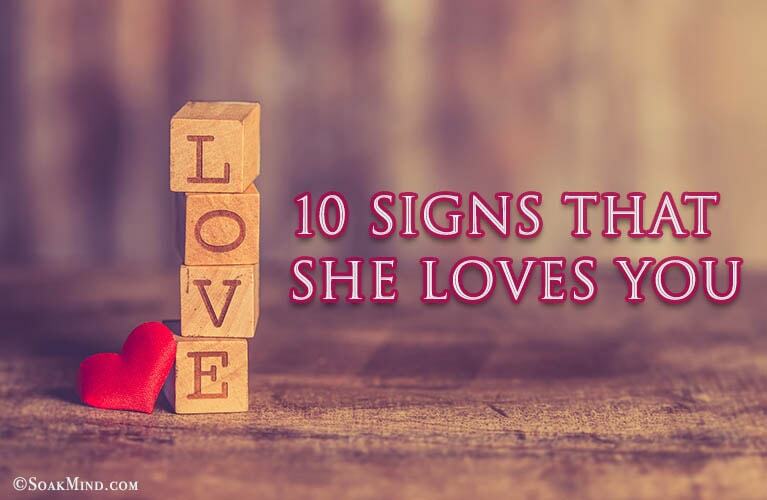 So my lovely men, for all of you, here are ten signs that she loves you. While with others she might be the reserved and shy kind, but with you, she’d want to make that move. With others, she might not initiate a conversation or a discussion. But, with you, it might be an accidental co-incidence or a voluntary try to start a random conversation to keep things flowing. What can be the possible scenarios that she takes a step? She might not text others on her own. But she drops you texts randomly, out of the blue asking about usual things and carry the talk on. She might drop morning and evening texts to casually ask how are you keeping. Or randomly she would pass compliments to kick-start a conversation. If she’s in the same class or office, she might talk about a test, notes, exams, a submission, a report or a project even if you are not a part of the same one. She might come across as a frequent sight around. And she might wave or smile to you when she sees you in the morning or as she leaves for home. If you notice some of these hints in your life, then they definitely are the signs that she loves you from the core. Do not let go of such woman. She’d want to know how your day was, who your friends are and what do you like to do when you are free. She’d be interested to know about your hobbies, interests, likes, and dislikes. If you tell her something about your interests, she would pay due attention to the same. And would listen to all of it with full concentration. Not just this, she would want to know more about the kind of person you are. And the kind of ambitions and goals that you have in your life. She would want to know about your relationship with your family. 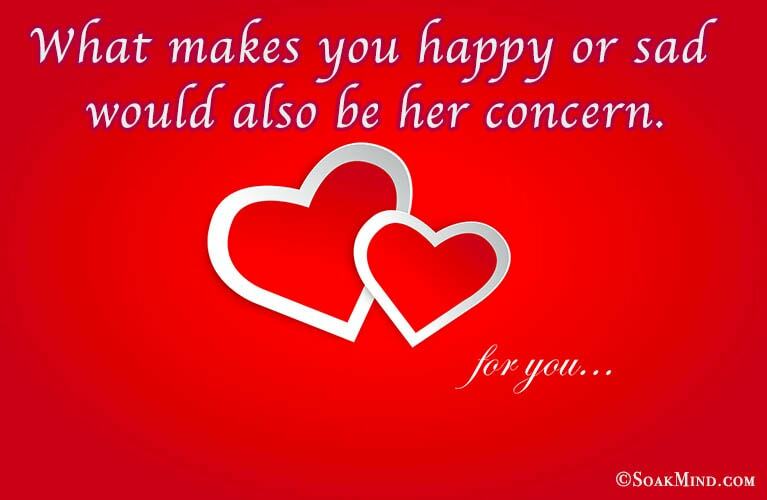 What makes you happy or sad would also be her concern. If she spots you feeling low, she would make sure that she asks you the reason for the same. This is definitely a sign that she loves you. In every aspect of your life, she would be genuinely interested. And she would give a patient listening whenever you wish to vent out to her. She would never make you feel uncomfortable and help you in feeling easy when things are not your way. Whenever you are faced with a dilemma or need a support of any kind, you will always find her around. She will not be the kind who feels only men support their ladies. Instead, that woman will be your pillar of strength and support whenever you need her to be the same. She’ll support you to achieve whatever you wish in your life. She’s not going to be the complaining kind and shall understand the various demands and expectations in your life. She will not be the kind who will completely lose her mind over an issue without listening and understanding your side of the story. Moreover, she will try to understand that things may go wrong, but it is not intentionally that they have been messed up. She will understand your ambitions and never pull you back from working tirelessly on them. She will understand the various aspects of your life. The woman respects your dignity and self-esteem and doesn’t hurt them or pull you down. She respects both your strengths and weaknesses and doesn’t judge you on your flaws. She is the kind who knows that respect is essential when you love a person. Whenever you are bogged down or feel very low, she is going to motivate you by infusing positive energy into you. She’s not going to let you give up or be pessimistic about things. Instead, she will try to lighten your mood up by telling you a different side of the story or try to cheer you up by various other means. She will motivate and push you to come out and face situations. That woman will add optimism into you. She will not be the one who doesn’t accept her mistakes. And will gladly apologize on realizing her fault. Also, she will not keep grudges about the things that have already happened, who’s chapters have been closed. These are some of the signs proving that she loves you and respects you. She is going to be the kind who definitely loves to have importance and space in your life. The girl would want to be a central figure of attraction in your life and would want you to pay heed to her. But, along with all this, she will also give you your personal space in your life. She would understand and know that she may be very important to you but is definitely not the only thing in your life. What all can be the instances to prove this? Be it going out with friends, completing an assignment/report, spending time with family or taking some time out for yourself. She would understand that these things are also an essential part of your life which require time and attention from you. She would respect your individuality with and without her and would give you your personal domain which she wouldn’t barge forcefully into. With her in your life, she would still know that you have a personal life and will let you comfortably enjoy that too. 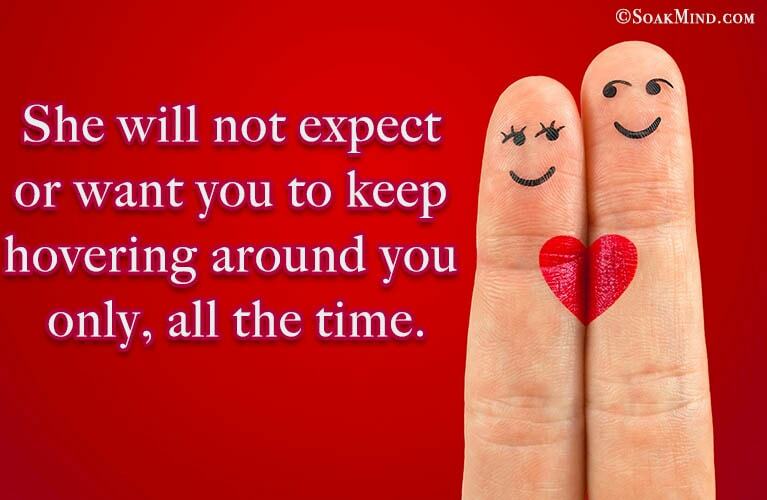 She will not expect or want you to keep hovering around you only, all the time. Even if things go wrong, she will try to mend them up with you because she appreciates the importance of you. And that woman will respect the bond that you have with her and she wouldn’t want to risk it to situations. As a person, she will help you grow and feel better about yourself. When things go wrong in your life or hers, she will try and help to mend them up so that they change for the better. She is going to be considerate of your physical, emotional and mental wants, equally well. She would help you grow as an individual because love enriches the personality of a person and is evolutionary in nature. You will notice a sense of growth in your being. The woman in your life would know that just like others, you are a human too. You have your own set of flaws, faults, and imperfections. She would recognize and acknowledge your faults and flaws, yet respect you for the way you are. How can you know? She wouldn’t expect you to be the perfect human all the time and love you equally after seeing your imperfections. That woman would not judge you on their basis or try to pull you down. Instead, she will learn from you and try to teach you what she knows better. In this way, she will try to mutually enrich the both of you so that the end result is development and not change. She will not expect you to completely change yourself for her when you get together. Instead, she would just expect you to make considerable efforts for her but not change your being altogether and leave all your habits completely. If she ever helps you in changing, it is going to be positive, slow and steady in a way that you don’t explicitly see or sense the change happening. She is going to help you become a better person than before. There are many instances when you can know when the woman trust you and when not. Let’s find out few of those instances. She isn’t going to be doubtful about you and keep asking you questions about your whereabouts. The girl totally trusts you and knows that you can have friends, who are girls too. She will not be suspicious of your intentions with other women because she knows the kind of person you are. And hence, she shall be not be unnecessarily insecure or doubtful. Trust is important for love and hence, a mutual sense of trust shall prevail between the both of you if she loves you. 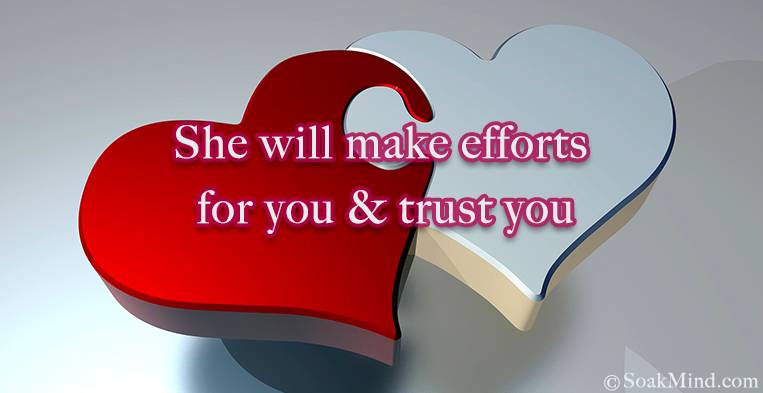 She will also trust herself with you and know that you will not break her trust. She will make efforts for you, the kind she doesn’t usually make for others. There can be a possibility that she will push her limits and go out of her way as much as she can to make you feel special. She will come up with novel ideas to impress or surprise you so that you feel happy and important. She might dress up especially for you or plan a big surprise. Moreover, she would take care of little details and pay due attention to them. The kind of things she will do for you, will give you explicit signs that she loves you. The girl won’t hide things from you. Be it good or bad, she would be explicit and blunt with you in terms of emotions, issues or misunderstandings. She would be absolutely loyal and true to you. She is going to be the kind who knows morality and love that she has for you. That woman is not going to keep quiet and let things brew but instead be straightforward and will want to discuss things out with you. If she is giving signs that she loves you, the kind of things she says and does for you, are only going to be for you. And she will never share the same expressions or emotions with anyone else while she is taking those leaps for and with you. From her mind and heart, she is going to be completely true to you because she would understand that lying or hiding are mini steps towards betrayal. She will hence, be sensitive towards what could pinch you and try avoiding the same or reason it out clearly with you so that it doesn’t hurt you. She would not be insensitive about your emotions or opinions. Instead, she would always want to discuss so that love blooms smoothly and beautifully. Lastly, if she loves you, she is going to be a totally different version of who she is in front of you. How? She is going to be the truest version of herself which is bereft of any inhibitions or masks. She will be completely herself, childish and commit errors without stressing herself or making herself conscious. That girl would blush and be shy when you are around. The butterflies in her stomach when you are around and the glow in her eyes will be clearly visible around you. If she loves you, your mere presence will change the way she behaves and reacts to situations. She will be an altogether different human in your company. She would feel very secure and comfortable around and that is why she loves you. These, among a lot of others, are basic signs that she loves you. These are her ways of showing that you are important to her and valued a lot in her life. She might not be able to explicitly tell you everything at once but if you closely observe, her gestures and eyes will definitely do all the talking.